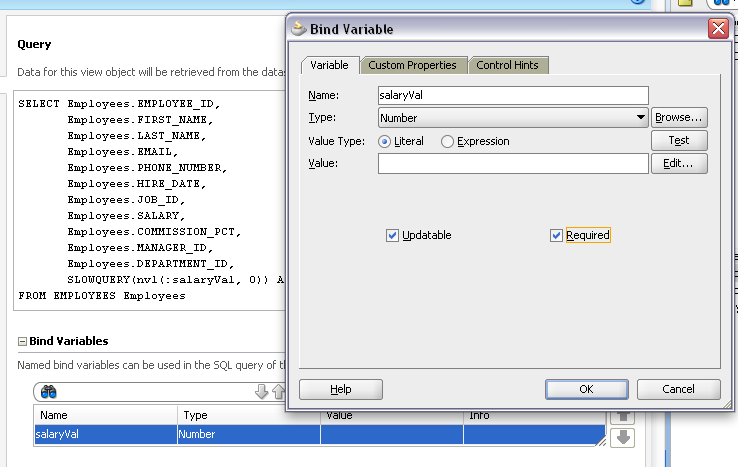 Who likes, when ADF screen hangs on long running SQL query? 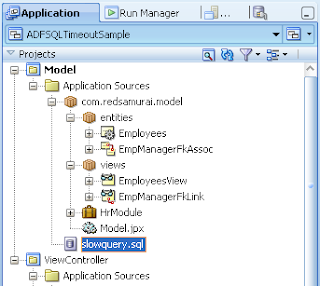 I guess no one, so today I will describe how to take control on long running SQL queries and bring ADF screen back to life. 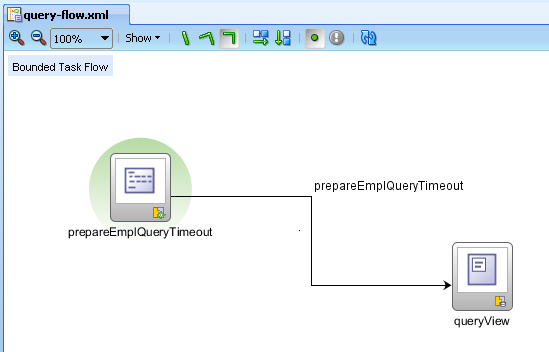 ADF BC allows to set VO query execution timeout, we can apply this approach to limit SQL query execution time and make it predictable. 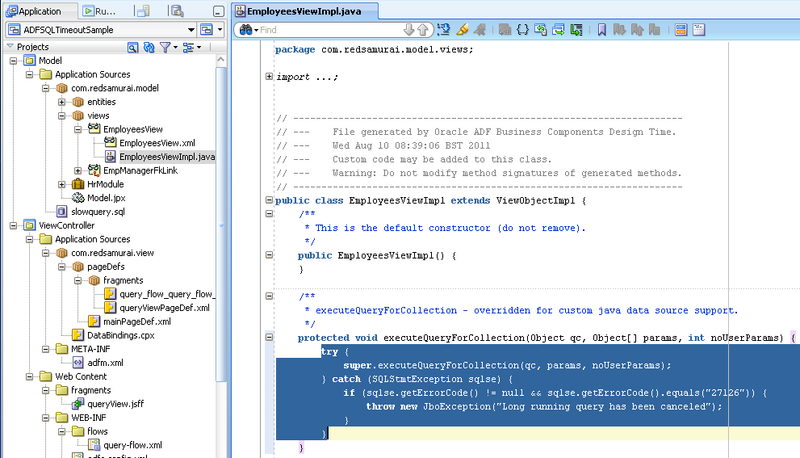 Sample application is set with maximum VO query execution time to be 6 seconds (6000 milliseconds = 6 seconds * 1000). This means, if query will be running longer than 6 seconds, it will be terminated and control will return back to the user. Good post, but I'd rather set a resource quota in the database itself - this way no matter where the SQL statement is being issued from it will be controlled at a single point. Very true. 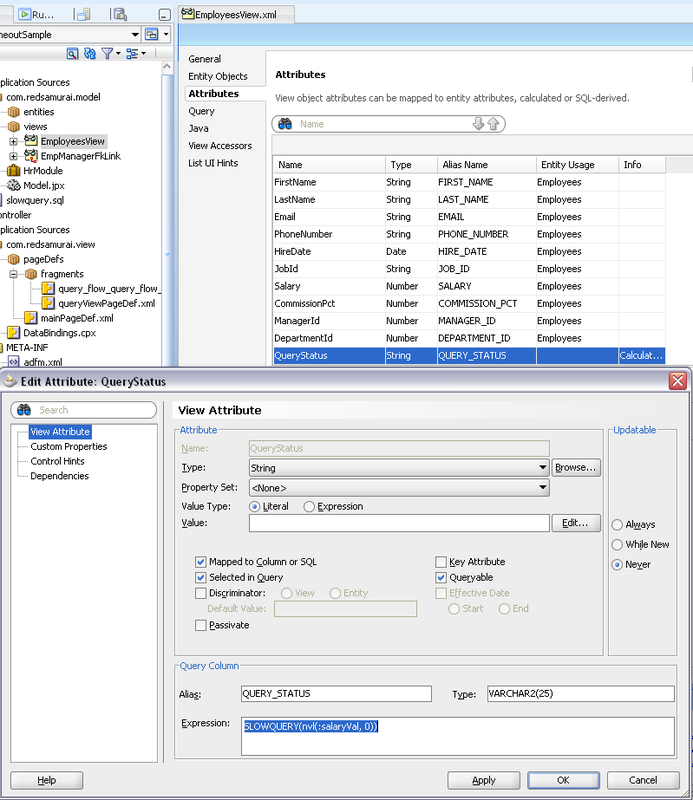 However in most of the cases DBA's are from different team, and they are not exactly happy to adjust DB settings based on development request. Also it might be there are different systems using same DB, and it may require different SQL execution time. 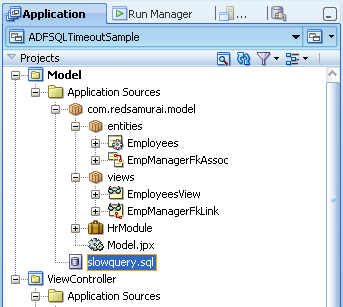 Of course, both options are good, but I believe its quite powerful to control SQL execution from ADF app itself as well. 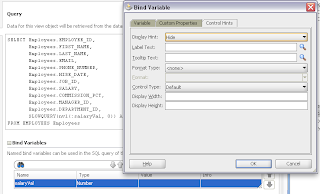 how to get the SQL Error code in order to override it. how you got 27126 error code. What is 27126 error code? 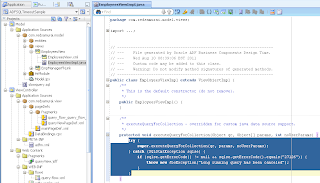 You can retrieve SQL exception text in the same method, and re-throw new JboException or update existing one. 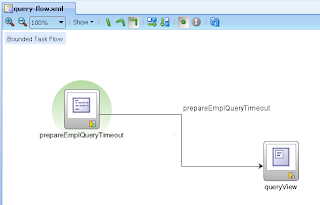 We have the statement-timeout set to 5 minutes in the jdbc-connection-pool-params settings which sets the timeout for every query but the UI was broken after we displayed the timeout message and clicking anywhere on the page would cause a fatal exception. Re-throwing a different JboException fixed this. 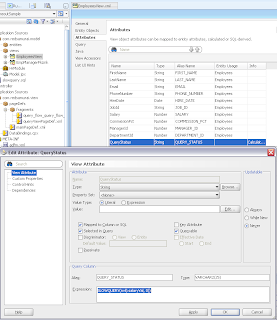 If i remember correctly, SqlStmtException was not propagated to UI and application was in broken stage. 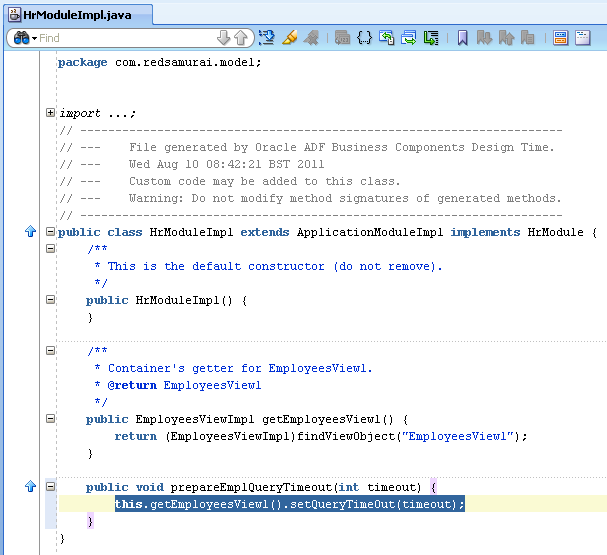 Thats the reason of using JboException. I did some experimenting on how to force a query to be canceled from the UI and wrote about it here. VO instance should be accessed through AM module, otherwise there might be problems on stress test environment, when AM pooling will be activated. 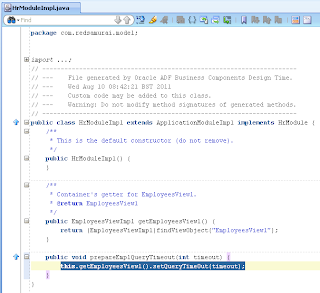 Since PS2 ADF will process requests on the same Session concurrently if they are not on the same page. ie. In a different browser window or browser tab or running within a Frame. That is what I experimented with and it does work. 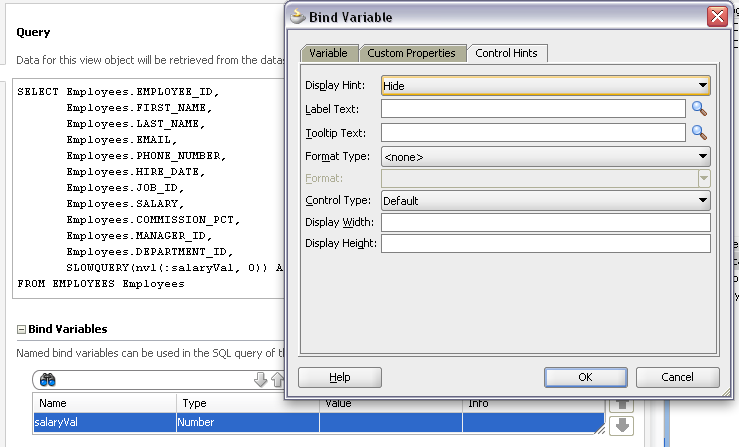 I was able to immediately cancel a long running query running in a different window. 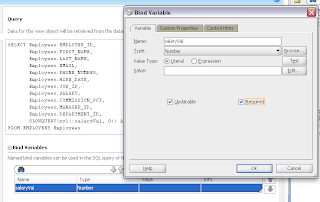 The Other window would return immediately with the "User canceled query" message. Thanks for update :) I like your new sample solution much more comparing to the previous one. I have an issue here. 1. 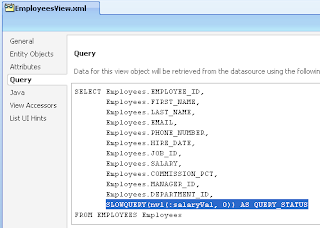 I executed a query and got results back, results rendered as table. 2. 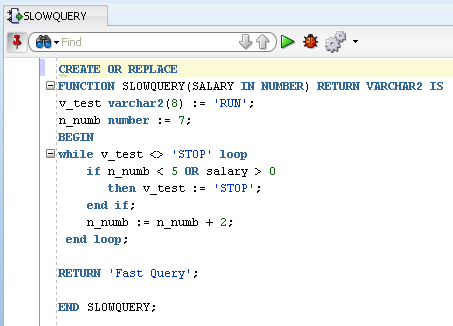 I executed a long running query now. 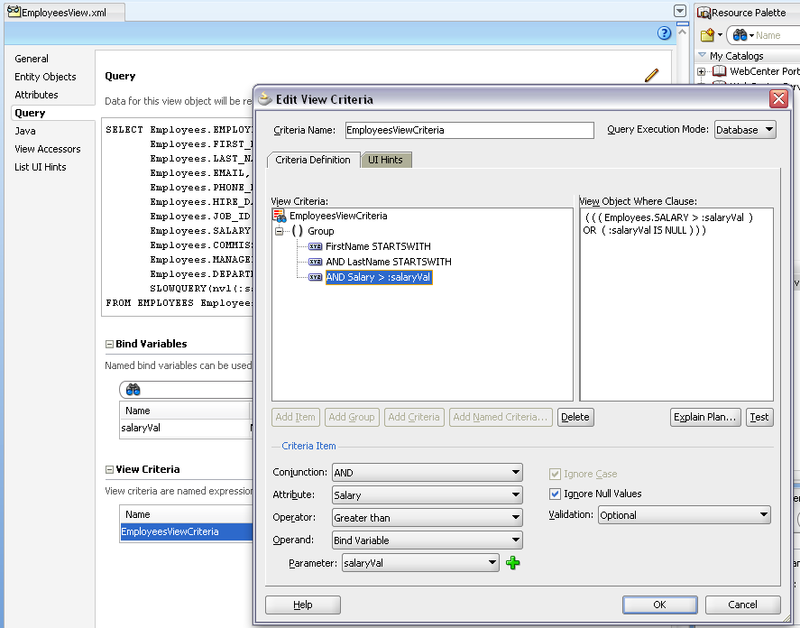 The query times out and the message in the catch block is shown. (Which looks good from the UI). 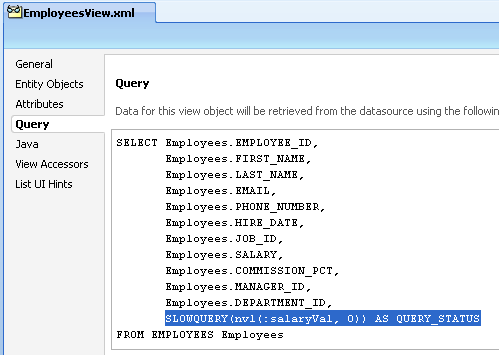 But when I checked the logs I see an SQLSyntaxErrorException, and the printed query has 2 where clause. 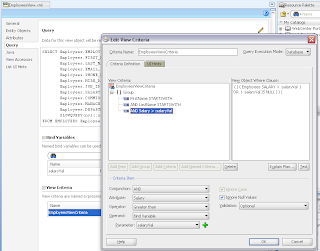 Something like WHERE ORDER_NUMBER = :fbkKy__0 is appened and the value for fbkKy__0 seems to be the primary key value for the first row of the results shown in step 1. Any idea how I can get rid of this error?